For the 2012 data, as reported by PETA, to the Virginia Department of Agriculture, click here. For an Op Ed piece written by Ingrid Newkirk where she writes that PETA supports an automatic destruction policy for all dogs who look like “pit bulls” in shelters, click here. 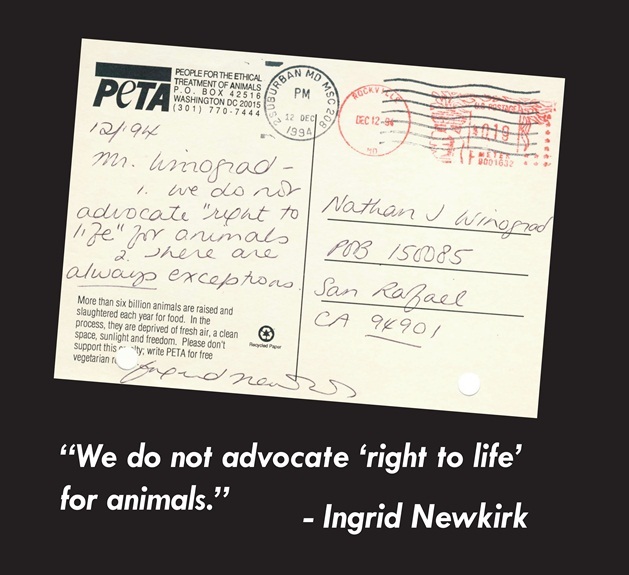 For a postcard written by Newkirk where she admits PETA does not advocate “right to life for animals,” click here. For evidence that PETA employees were rounding up animals, killing them within minutes in the back of a van, and dumping their bodies in trash bins, click here. PETA gave a No Kill shelter a basket of cookies to celebrate an announcement that they would start killing again after four years. To learn more, click here. Rainbow Rescue on giving animals to PETA: “I thought it was the answer from heaven. We just thought ‘PETA is the godfather for animals. '” They were told that the animals they transferred to PETA “would be prepared for potential adoption.” They were lied to and ended up dead. Click here for the story. Over the objections of feral cat advocates pushing for a TNR program, the Mayor of Miami Beach pushed a plan to trap and kill feral cats. PETA sent a letter to the Mayor applauding his decision. The Mayor, however, had also decided that kittens would be turned over to a rescue group for socialization and adoption. But PETA took issue with this part of the plan, arguing that all the cats, including the kittens, should be taken to animal control and “euthanized by sodium pentobarbital injection.” Click here for PETA’s letter. For information about PETA killing in the face of alternatives, testimony by a veterinarian that the cat and kittens he gave PETA after they promised to find them homes were healthy but killed within minutes, their defense of neglectful and even abusive killing shelters, their opposition to TNR for healthy feral cats, their claim that cats should be rounded up and killed and so much more (read the articles and follow the internal links), click here. You either love animals or you love PETA, but you can’t love both because the two are mutually exclusive.